As the previews faded and Luxo Jr. began hopping across the screen, we knew we were finally going to see La Luna. From the opening scene to the ending credits we were mesmerized by the simple beauty of the short film! Set in the evening, La Luna had an incredible glow - the lighting team did an amazing job creating the moonlight flickering off the water as well as the inner glow from the stars. Yes, we said, sweeping up the stars - the family has a very unique job. One evening, Grandfather and Father have set out to finally introduce Bambino to their line of work. The film begins with the small rowboat coming into frame with "La Luna" painted on the side, we loved this thoughtful detail. As their boat coasts through the water, the bickering starts immediately as Bambino receives a hat to commemorate his first night on the job. After Bambino puts the hat on, his Father moves the brim of the hat down very low to his eyes (he almost can't see over the brim). Bambino's Grandfather disagrees and feels the old school way of propping the brim high is the way to go - so he grabs Bambino and pulls his brim way up. As the brim straightening goes on for several rotations, the moon appears and the trio all spring to attention as they know they have work to do. This is when the true beauty of the film begins. The water and moonlight are animated to absolute perfection. It's not just the organics that are beautiful in this short, but the emotion that is portrayed by the characters. When Bambino copies his Grandfather and Father as he crosses his arms while the trio sat in the rowboat, it brought Julie to tears. Bambino's Father pulls out a ladder and ensures Bambino that it will be alright to climb up the very tall ladder to the surface of...the moon. Bambino reluctantly ascends the ladder and as he approaches the top, he must anchor the boat to the moon so his Grandfather and Father can also get up to the moon. This is where the true magic and whimsy takes place. I must say that the idea of how Bambino gets from the boat to the moon was delightful. Being that we are in our 30's, we truly wish we were children again watching this - it was pure magic and full of imagination. Enrico Casarosa has definitely proven his artistic directorial skills as well as beautiful storytelling. From the funny comparison of the brooms being compared to Father's mustache and Grandpa's beard, to the wonderful crescent moon shapes hidden within Bambino's eyes at the end of the short, we were captivated through the entire short. If you love La Luna as much as we do, you won't want to miss out on the La Luna storybook and Bambino plush. 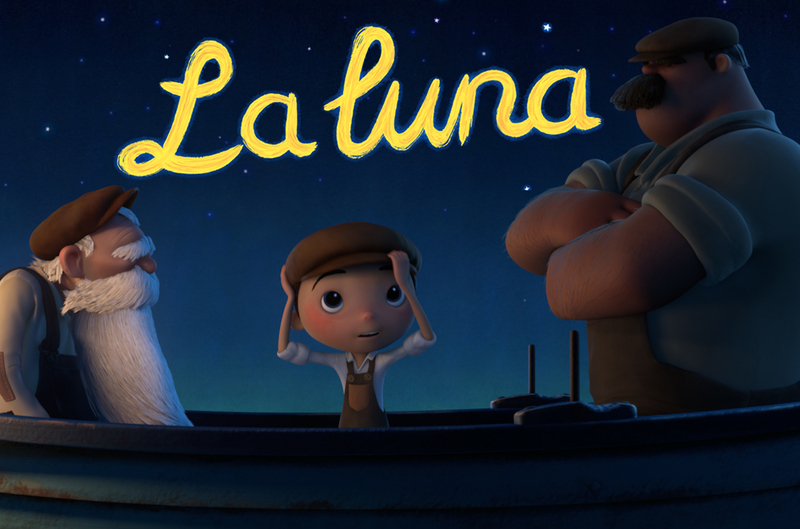 La Luna is most definitely in our top picks of Pixar shorts. 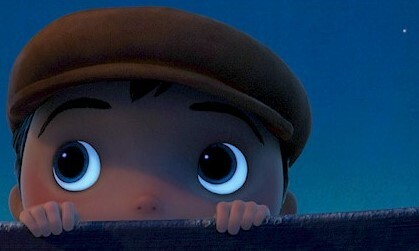 We just hope that there will be a Director's Commentary for La Luna on the Brave Blu-Ray. What did you think about La Luna?